To be perfectly honest - this didn't turn out quite as I'd envisaged! But that's the nature of crafting - I'm not unhappy with the result, even if it wasn't the one I was expecting! I was experimenting with inky layers and the emboss resist technique. Starting with a piece of Shimmery White cardstock (because it's able to withstand the abuse I was planning to throw at it! ), my first step was to stamp the textured ribbon image with Versamark and clear heat emboss it. Next I sponged the entire piece with Pool Party ink and stamped the splodges with Pool Party ink. I then very thoroughly wiped the surface with my Embossing Buddy before stamping the butterfly with Versamark and clear heat embossing it. Next, I inked the leaves with Versamark and then immediately with Emerald Envy and stamped the image. I quickly added clear embossing powder and heat set it. I used a clean sponge dauber to add more Versamark to the leaves and sprinkled on the clear embossing powder. Once I'd tapped off the excess powder, I used a small, clean paint brush to clean away any excess powder from around the leaves before heat setting. After another wipe with the Embossing Buddy, I stamped the ribbon image again with Versamark and heat set it. I did some more sponging with Pool Party ink and then Bermuda Bay, concentrating on the edges and pulling it in towards the centre. Then I stamped the edges with Emerald Envy ink and sponged the edges with Emerald Envy ink, blending it out but covering less area than the previous inks. I made the card with an A5 piece of Emerald Envy cardstock and added a layer of Pool Party before the decorative layer. It wasn't my intention to add any more layers or labels but, being honest again, when I stamped the greeting straight onto the card front it had no impact. 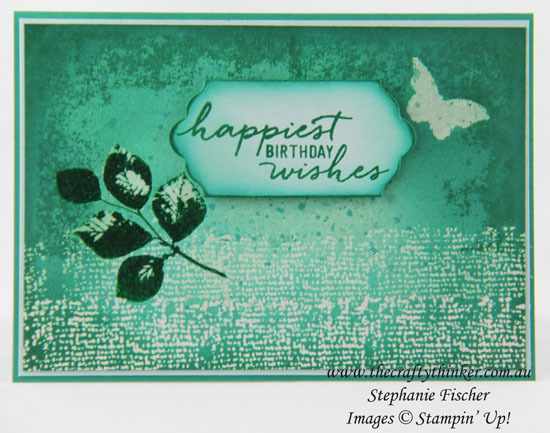 So I stamped the greeting (from Watercolour Wishes) onto a label cut with one of the Lots of Labels dies (I adjusted the size to fit the greeting) and sponged the edges with Bermuda Bay and then a touch of Emerald Envy. Since I now had an extra layer, I made the most of it by popping the label up on Stampin' Dimensionals. 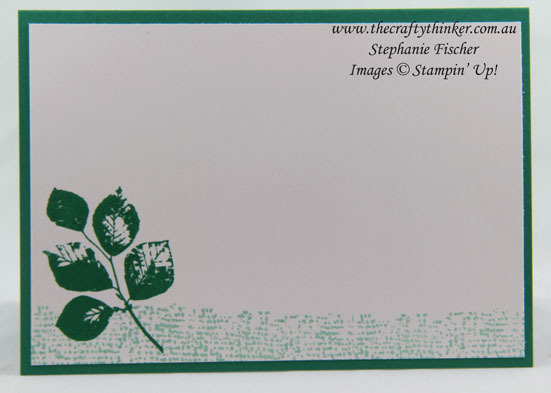 I used Pool Party and Emerald Envy ink to stamp the inside of the card.